Taking a sightseeing tour, going for a business meeting or traveling to a getaway is always possible when on board the De Havilland DHC-7. This short range plane has a space which accommodates 54 passenger seats. Its private version may be adjusted depending on what you’ll agree with the operator. Did you know the DH-7 also has Short Take Off and Landing (STOL) capabilities? This means you’ll have more airport options to choose from. You can fly to or from remote areas, or reach an airport that’s nearest your intended location. The De Havilland DHC-7 may additionally be considered as a flexible jet since its cabin can be transformed into a freight carrier to fly cargo or pallets. Hence if you’re attending a business conference and you’d like to set up a booth in the venue, you can bring your paraphernalia along. You may also bring your hobby-related equipment for vacations. This aircraft allows to you have your cargo placed in one part of the plane, while you comfortably sit in the cabin’s passenger area. 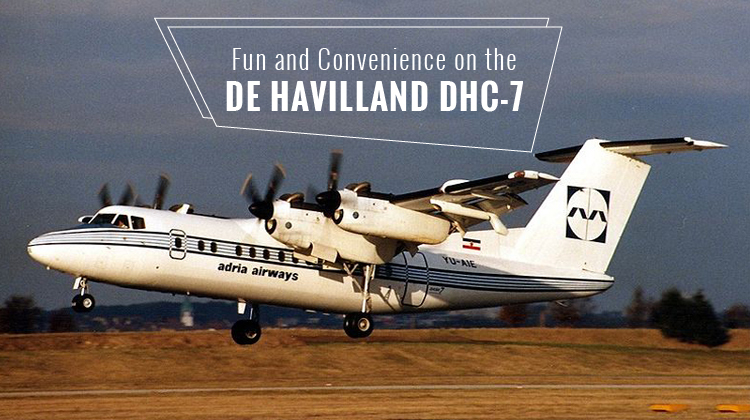 The De Havilland DHC-7 has been upgraded and customized to fit the ever changing needs of passengers. Depending on what your service has set up, the DH-7 may have a galley to prepare your snacks and drinks throughout the flight. The lavatory may also be placed at the rear part of the cabin for utmost passenger comfort. Its interiors have seats which may be reclined, and the latest interiors may have club laid out seats. Each passenger seat may have its corresponding pull out tables so you can relish your snacks throughout the trip. The table may also be used as a platform for your laptop to catch up on your emails. As you hop on the DH-7, you’ll get to experience steady flights so you can enjoy the landscapes, seas, mountains and towns you’ll be flying over. Flying on this plane means you’ll get to reach as far as Nassau, Bahamas, or Texas, USA if you’re coming from Toronto. Should you plan to reach a much farther destination, it’s best to confirm how much load you can bring with the operators. A much lighter aircraft generally means you can reach farther destinations at a much faster rate. Since its first flight in 1975, the De Havilland DHC-7 (or Dash 7) had roughly 113 units built and flown all over the world. It has witnessed manufacturing company transitions, since it was originally built by de Havilland Canada and when de Havilland was bought by Boeing. Later on, it was Bombardier who took over in handling the Dh-7 units. During its introduction, the Dash 7 was envisioned to be among the largest within the short-range, regional plane category.